Even if you’ve never been able to master the liquid eyeliner in the past—this silky liquid eye definer is a must for instant chic. Deep pearlized marcasite gray slips on easily with our microfine brush along your lash-line for a chic eye in just seconds. I really like this product. I love the packaging, which is small and cute. The colours are striking, and make you want to purchase the product. I recently came across this product when in the market for a new eyeliner and absolutely had to have it. 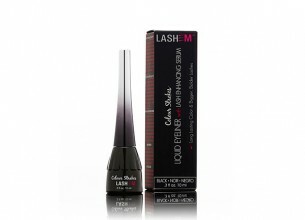 The eyeliner applicator is small and thin, which is perfect for creating a cat eye and other trendy styles. The liner is extremely long-lasting; I applied it early in the day and did not need to touch-up my eyeliner at all throughout the day. Although it is not a waterproof product, it sure seems that way. It is smudge-proof, which is great for people who rub their eyes often. Although it is a bit pricey, it really does a great job. I would repurchase it in the future and would definitely suggest it to those who are looking for a terrific, long-wearing eyeliner.